“I think there’s a real potential to see increases in HIV infections,” said Brian Honermann, deputy director of public policy at amfAR, the Foundation for AIDS Research. “Implementing the policy in the way it’s being done does disrupt services,” Honermann told NBC News. The policy, officially called the Protecting Life in Global Health Assistance Policy, forbids giving U.S. federal funding to any foreign organization that performs abortions or, in many cases, that even mentions them as an option to women. It requires groups that get U.S. funding to pledge that they will not use any money, from any source, to provide abortions. So the groups will have to forgo all U.S. funding if they want to keep abortion in the mix of services they provide, or if they want to support other groups that do. The rule has been lifted and reinstated by various administrations for more than 30 years. Former President Barack Obama lifted it with one of his first executive orders. Under former President George W. Bush, the rule applied to family planning groups. But President Donald Trump’s 2017 executive order expanded it to apply to all U.S. federal foreign health aid. 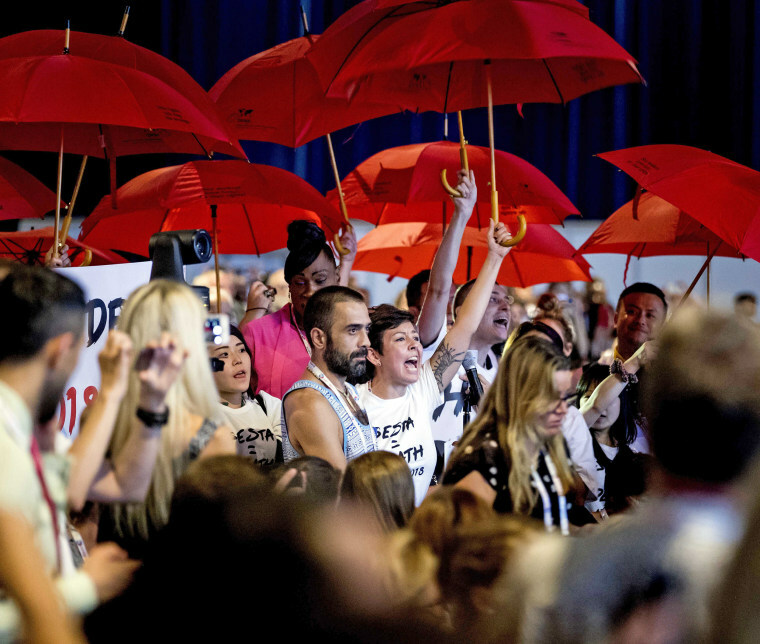 Global health organizations warned that it would disrupt decades of efforts to fight the epidemic of human immunodeficiency virus, which causes AIDS. Will Trump slash funding to women's health groups? And now they say they have evidence that it has. HIV infects nearly 37 million people globally, according to the United Nations organization UNAIDS. Stepped-up efforts, often led by the U.S., mean that nearly 22 million people are now getting the HIV drugs that can keep them healthy and that can prevent further transmission of the virus. But they need access to clinics to get the drugs. And because money to fight AIDS has been woven into programs set up to deliver health care in general to people who couldn’t get it before, it could cause much wider harm. “We found that small community-based NGOs (nongovernmental organizations) that had 10 to 15 service providers have now had to cut to five or even three,” said Tikhala Itaye, who chairs the global SheDecides movement, a women’s rights group. The reduction in services can hit women especially hard, because in most of the countries hardest-hit by HIV, the virus is transmitted sexually. “In sub-Saharan Africa, three in four new infections are among girls aged 15–19 years and young women aged 15–24 years are twice as likely to be living with HIV than men,” UNAIDS said in a statement. So work to prevent HIV often starts with providing health care in general to women. And that care is being disrupted, Itaye said at a news conference at the AIDS meeting. “In Kenya, for example, the Center for Adolescent Health has been in a situation where they were supporting 15,000 adolescent girls living with HIV. They’ve had to cut that … to below 10,000,” she said. “Now we are dealing with a rise in unsafe abortions. They are using glass or they are using hot oil or they are using sticks,” Itaye added. Jennifer Kates of the Kaiser Family Foundation said her team is trying to analyze just how many organizations could be affected by the policy. It’s affecting PEPFAR, the President’s Emergency Plan for AIDS Relief, which is credited with not only fighting AIDS but also improving health services around the world. “Our analysis indicated that the expanded policy will likely affect hundreds of NGOs,” Kates said. For instance, she said, 264 groups get money directly through PEPFAR and would be affected, as would the many more hundreds of organizations that are funded indirectly. In some cases, Honermann said, health or aid organizations will be unable to accept funding from their own governments. “The HIV response, it’s still an emergency,” Chloë Cooney of Planned Parenthood Global and the Planned Parenthood Federation of America said at the news conference. Cooney said the true effects of the policy may not be seen for years. “Some of the greatest harms of the global gag rule will not be measurable on a broad population or national level until it’s too late to reverse course,” Cooney said. Groups that might be affected by the funding restrictions don’t want to speak openly about the possible effects because of fear that it would make them targets for bigger funding cuts, Honermann said. “Nobody really does want to speak about these policies,” Honermann said at the news conference.